Turnover in DC’s residential property market-Who sold in 2015 and who were the biggest winners? The real estate market is characterized by a constant churn of activity that results from residents who for various reasons –job relocations, a desire to upsize or downsize, move to a different part of the City or elsewhere–sell their homes in any given year. This normal churn of activity can be influenced as well by economic and market conditions that can make it more difficult or less advantageous to sell. In this post we examine sales of single family homes in the District to see how long sellers in the District held on to their property before selling and whether the gains realized by sellers depend on how long they held their property. Here’s what the data shows for single family home sellers in fiscal year 2015. The highest median appreciation was for those who had been holding on to their properties for over 14 years, these sellers realized median gains of over $324,000. The lowest gains realized were for those who purchased their homes 8 to 9 years ago at the height of the previous housing boom. For these sellers the median gain was only $46,000. Sellers who bought their homes recently, less than 5 years ago, also realized substantial gains exceeding $100,000. The median gain for all sellers was $108,000. There were 185 properties with gains that exceeded $500,000- Thirty-one sellers realized gains exceeding $1,000,000. More than half of the sellers held on to their homes for less than 7 years, with a median hold time of just over 6 years. The data indicates high turnover among sellers who hold on to their homes for less than 3 years. This is consistent with other data that we have analyzed on mobility in the District. Data from the National Association of Homebuilders indicates an average hold time of 10 years for the nation, another indication of the higher housing mobility in the District. Data was compiled using information from the DC Office of Tax and Revenue and the DC Recorder of Deeds. The data focused on market rate transactions of single family homes, excluding non-arm’s length transactions. Sales of single family homes in FY 2015 totaled 3,674 based on preliminary data. The country is debating a $15/hour minimum wage and a ballot proposal, if approved, will place D.C. among the company of Seattle, San Francisco, and Los Angeles, which have already raised their minimum wages to $15/hour. If this happens, whose wages will be affected? We looked at D.C. workers who earn up to $15 an hour and where they live. It turns out, a majority of the workers who currently receive an hourly wage under $15 are not D.C. residents. Using American Community Survey 2013 data, we found that almost 70 percent of D.C. workforce is comprised of out-of-state residents (roughly 550,000 out of 800,000). Furthermore, there were 50 percent more out-of-state resident workers than D.C.-resident workers who earned between $8 and $15 an hour. • 550,000 Total out-of-state residents working in D.C.
• 250,000 Total D.C.-residents working in D.C.
• 60,000 Out-of-state residents who work in D.C. and earn between $8-15/hour. • 40,000 D.C. residents who work in D.C. and earn between $8-15/hour. Of the approximately sixty thousand under-$15/hour- workers who commute to the District, 63 percent come from the Maryland counties closest to D.C., especially Prince George’s county. Northern VA residents account for another 20 percent. The remainder commute from further-away places. This composition of residency is similar to the share among the higher income commuters. Data on where people live and work are from the 2013 American Community Survey (ACS) with a margin of error of +/-11%. This range does not overpower the effect for this research. The number of D.C. jobs, 800,000 include self-employed and military. Our monthly statistics on the jobs in the District is lower at about 750,000 because it excludes these two groups. We excluded from our analysis people making less than $8/hour—the minimum wage in D.C. is above that, which suggests that these people won’t be affected by another hike in the minimum wage. Government employees have traditionally enjoyed generous fringe benefits. The popular conception is that working for the government might mean a lower salary than one could get elsewhere, but job security and fringe benefits—primarily health care benefits and pensions or retirement contributions—make up for that salary difference. That is not always good news for taxpayers and can create tensions between current budget needs and future promises. Some public employee pension plans around the country are less than 50 percent funded, and states and localities sometimes struggle to meet their benefit obligations, especially for pensions. These governments in the past may have reduced contributions to their plans when their budgets got tight, leaving their plans underfunded. The District does not face pension cost pressures, primarily because most of its employees are not in traditional pension plans. Over two-thirds of District employees receive pensions in the form of defined contributions that are a share of their salaries, and in retirement their financial security will depend on these contributions and the returns on them (plus Social Security and any other savings they might have). For the remaining one-third of District employees who are in defined benefit plans, the District’s pension plans are 100-percent funded—that is, the city has set aside sufficient funds each year to cover the full cost of future retirement costs. (The District also benefited from a good starting point: with the Revitalization Act of 1997, the federal government assumed responsibility for the District’s unfunded pension liabilities to that point, and the District has been responsible for only pension liabilities accrued after 1998). However, the District has been spending more on fringe benefits over time. Data on the District’s fringe benefit costs show the following trends: First, fringe benefit costs, as a proportion of salaries, have grown over the past 15 years. Second, the driver of this growth has been increasing health insurance costs. Finally, the cost of retiree health care is a newly recognized cost driver, but the District is funding this obligation and stands in a better fiscal position than many other state and local governments. 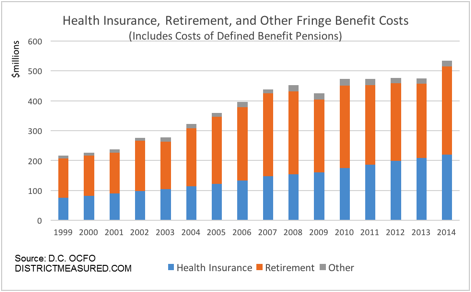 The primary components of fringe benefits are health insurance and retirement costs (defined contributions, which are five percent of base salaries, and employer contributions to Social Security and Medicare). Health insurance costs increased from 47 percent of all fringe benefit costs in 1999 to 56 percent in 2014. We know that per-employee costs of health insurance have increased, but the overall expenditure increase could be because of a combination of the cost increases and more people choosing to join the health insurance plans, since health insurance is an optional benefit. A future post could explore this issue. How does this picture change when one includes defined benefit pension benefits? Each year, the District sets aside contributions to the Police Officer and Firefighter Retirement System and the Teachers’ Retirement System. When one includes these costs with fringe benefits, the trends are less clear, because contribution amounts to defined benefit plans vary from year to year depending (in part) on stock market performance over time. When adding these costs, retirement costs clearly become a larger share of the total. Nevertheless, health insurance is still increasing as a percentage of the total, from 35 percent in 1999 to 44 percent in 2013 before declining to 41 percent in 2014. Like pensions, the promise of continued health insurance coverage for retirees represents a future liability for an employer. Unlike pensions, until recent years, this future liability had never been recognized on the books of state and local governments. A change made by the Governmental Accounting Standards Board in 2004, and phased in over following years, required state and local governments to recognize the liability for Other Post-Employment Benefits (OPEB), that is, benefits other than pensions. Retiree health insurance represents the bulk of these benefits. In 2006, the District chose to apply $138 million of surplus revenues as a down-payment on the accrued liability to date, and beginning in 2008, the District has made substantial annual contributions – at least $80 million per year – to cover new liabilities and also pay down a portion of the accrued liability. The District’s plan is 85.7 percent funded, well ahead of most other jurisdictions in dealing with the OPEB issue. 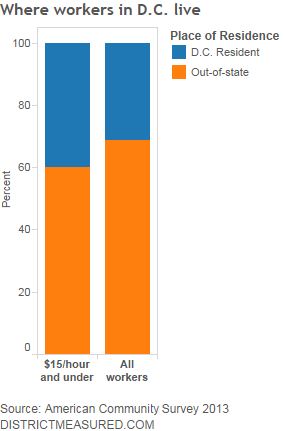 For example, at the state level, no state is more than 80 percent funded, and the majority are under 10 percent funded – see table 1 in this report on state OPEB funding . OPEB payments are not included in the expenditure data reported here for fringe benefits. They are clearly related to benefits, but the change in accounting treatment and the subsequent change in expenditure pattern over the 15-year period would distort other trends we can see in the data. Data come from expenditures recorded in the District’s financial system from Fiscal Year 1999 through Fiscal Year 2014. Most fringe benefit costs are part of each agency’s budget for its employees, and the actual expenditures are charged to this budget. Three separate agencies exist to record separate District contributions to the Police Officer and Firefighter Retirement System, the Teachers’ Retirement System, and Other Post-Employment Benefits (primarily retiree health insurance). Data from the two retirement systems are included in some of the analyses as noted. In addition, two other District costs for its employees are budgeted centrally – premiums for workers’ compensation and unemployment insurance. These costs are not part of the analysis. 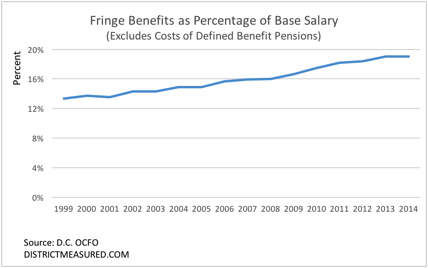 Details – Who Gets What Fringe Benefits Among District Employees? District employees are eligible to participate in employer-sponsored health insurance plans. The District pays 75 percent of the premium cost, and the employee pays 25 percent. Employees hired before 1987 choose from the same set of health insurance plans as federal employees; those hired after 1987 choose from a set of District-offered plans. Police officers, firefighters, and teachers belong to defined benefit pension plans. These so-called “traditional” pension plans provide retirees a benefit that is based on a formula incorporating the employee’s number of years of service and final salary. The District is responsible for funding the plans, and if plan assets decrease (e.g. because of a year of negative returns on assets invested in the stock market), the District must make up the loss, generally smoothed over several years. District employees (non-police, fire, teacher) hired before 1987 are in the federal Civil Service Retirement System (CSRS), a defined benefit plan that the District makes payment into. District employees (non-police, fire, or teacher) hired after 1987 are in a District-sponsored defined contribution plan. The District generally contributes 5 percent of employee pay to a retirement account, but that is the limit of the District’s responsibility. Any investment risk for funds in this account is borne by the employee. The District pays the employer share of Social Security taxes for most employees (CSRS employees and employees in the defined benefit plans do not participate in Social Security) and the employer share of Medicare taxes for nearly all employees. Depending on union status and a variety of other factors governing their employment, employees may have other fringe benefit options, such as life insurance, disability insurance, transit benefits, legal assistance, and employee assistance plans. There are two ways to count jobs when it comes to the District of Columbia: the number of jobs District residents hold in the city or elsewhere or the number of jobs in the city whether District residents or commuters hold these jobs. The U.S. Bureau of Labor Statistics counts both: in the 12-month period that ended June, 354,055 District residents held jobs (on average) and there were 759,667 jobs located in the District. It is not surprising that there are far fewer employed D.C. residents than jobs: as the central city of a large metropolitan area, the District holds almost a quarter of the region’s jobs but only about ten percent of its population. 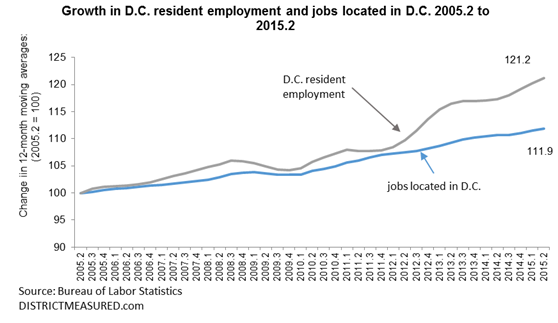 Indeed, there are more jobs located in D.C. than the city’s entire population. This makes it particularly noteworthy that over the past three and a half years, resident employment in D.C. has been increasing much more rapidly than the city’s job base. From December 2011 to June 2015, resident employment not only increased by a greater percentage (12.3 percentage v 4.6 percentage) than D.C.’s job base, but by more in absolute numbers—38,900 more resident jobs versus 33,500 more jobs located in DC. In the years leading up to December 2011, resident employment, and the job base grew at about the same rate, even allowing for the downturns in the recession. Thus, from June 2005 to December 2011 the job base grew 7 percent and resident employment 7.9 percent (representing average annual growth of 1.0 percent and 1.2 percent, respectively). Resident employment then began to grow faster. In December 2011, for every 1000 jobs located in the District, we had 434 employed residents (in the city or elsewhere); by June 2015, number of employed residents for 1000 jobs located in the city had risen to 465. This number did not grow because there were fewer jobs in the District. On the contrary, jobs in the District have been growing faster than before at 1.4 percent. However, resident employment has been growing much faster at 3.8 percent. 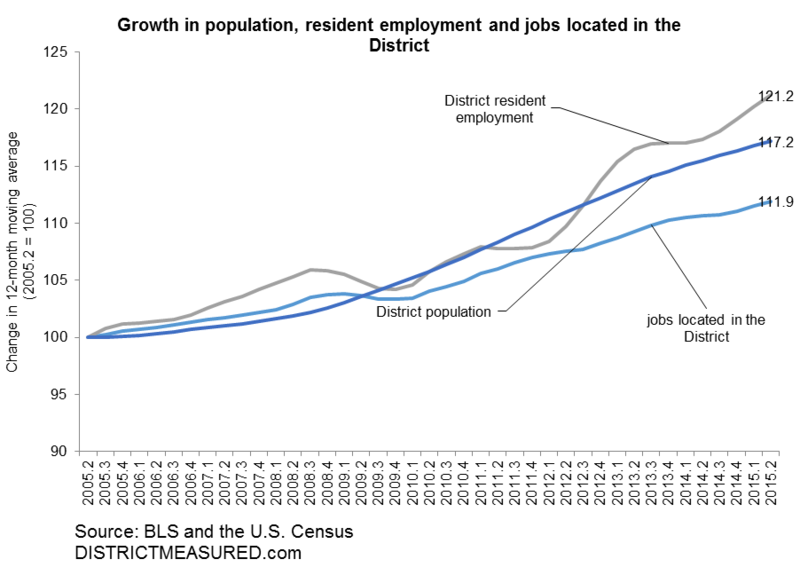 One factor that has allowed the District’s resident employment grow faster than the city’s job base over the past three and a half years is demographics. Not only did the population grow faster in the recent period (2.0 percent annual rate versus the earlier 1.4 percent), but also more of these newcomers are willing to work, and are able to find jobs . But three other factors that could be at play. First, it could be that the newcomers to the city are taking jobs that are vacated by commuters who have moved or retired. We have showed earlier that the top reason why people move to the District is jobs. If these newcomers are taking jobs vacated by turnover (retirement or any other reason) they will increase resident employment but not the total number of jobs in the District. Second, newcomers might choose to locate in the city even when they hold jobs in the suburbs. 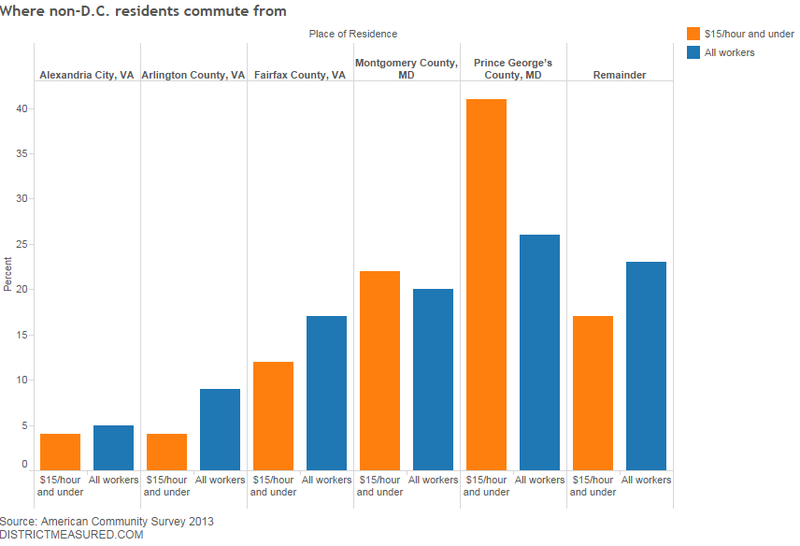 About 27 percent of D.C.’s employed residents were reverse commuters at the time of the 2010 Census, and more of this may be occurring. Thus, the net increase in jobs located in DC need not define how much resident employment can grow. There is a third, and rather underexplored, reason: self-employment. For example, a District resident who is working as an Uber driver would be reported as employed in a household survey. But the Bureau of Labor Statistics, which does not collect data from self-employed persons (they survey employers only), would miss this person in its counting of jobs located in the District. Is there is a limit to how long resident employment can continue to grow so much faster than jobs located in the city? There is no clear answer. 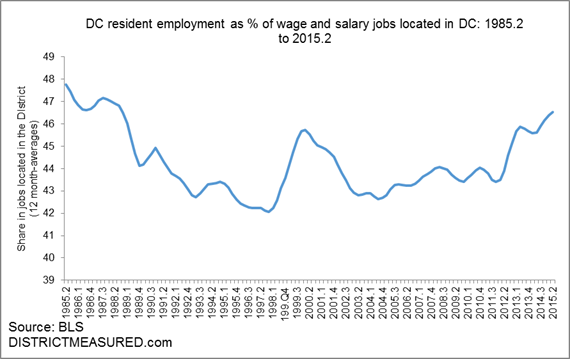 Over the past 30 years, however, the ratio of resident employment to wage and salary jobs located in the District has never been higher than 47.8 percent (in 1985, a time when DC had 17 percent of the region’s population, 33.6 percent of the region’s jobs, and had more people living in the city than working in it). At 46.5 percent we are not far away from this number, but suburbs were less important back then, both in how many workers they could send into the city, but also in terms of how many jobs they can give back to us. Each month the U.S. Bureau of Labor Statistics conducts two economic surveys that provide insight into the dynamics of D.C.’s economy. The first, a survey of employers of wage and salary jobs, measures the number of people working in DC regardless of where they live. The second, a household survey of residents, measures labor force characteristics including the number of DC residents who are employed regardless of the jurisdiction in which their job is located.